This recipe barely made it to the blog, you have no idea how hard it is for me to keep my creations long enough to photograph them. I practically have to ninja my way around the house to get the photographs set up. As soon as Sam smells what’s in the oven its a race against time and these cookies smell amazing! Yankie should make a candle out of them, I would definitively buy it! So as I’m photographing Sam is suspiciously interested in what I’m doing and the more I set up and the more photos I take I notice, the fewer cookies I have and the more guilty he looks! 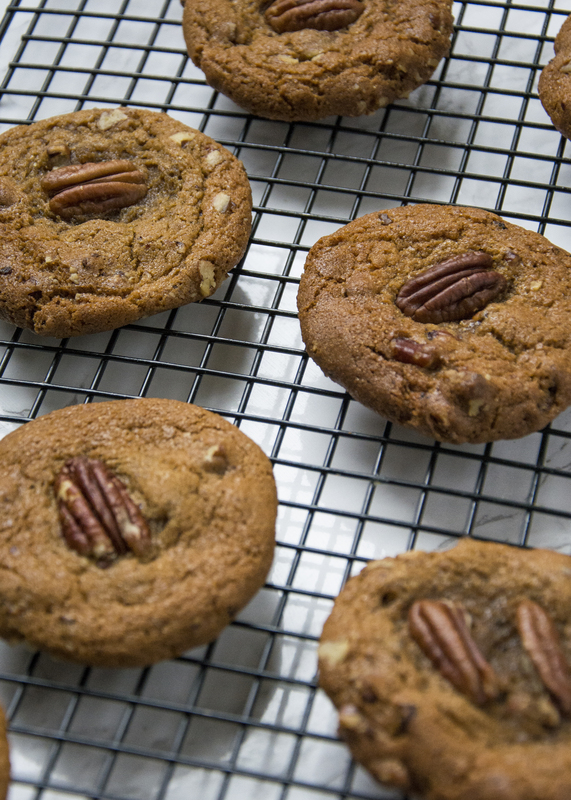 You can really experiment with this recipe if you don’t have pecans or cinnamon in the house. You could try hazelnuts or almonds for a good alternative or if you do’t like cinnamon don’t add it at all or you can substitute, powdered ginger, allspice or nutmeg. If nuts aren’t your thing you can add chocolate chips or raisins if you’re trying to be healthy. Please don’t think that you have to follow my recipes word for word if you want to add chocolate chips go right ahead! Have you ever browned butter? If not, fear not, it’s really easy. Browned butter is just a fancy phrase for cooked butter, it’s basically butter that has been cooked for a while past the point of melting. All you need is a pan and some butter. Add the butter to your pan and heat on a medium heat until melted. Once the butter has melted continue to cook the butter, stirring regularly until the butter turns a darker brown colour, be careful not to let the butter burn Although burnt butter comes in handy for other recipes, but that’s a whole other blog post. When your butter is a deep golden brown, take it from the heat and transfer it to a heatproof bowl, making sure you scrape every last drop of butter from the pan with a silicone spatula. It really is that easy to make brown butter. In a medium pan, melt the butter over medium heat until it has melted. Add the pecans and stir regularly until the pecans and butter have toasted and turned a lovely golden brown. Set the pan aside to cool until needed. Preheat your oven to 190C / 375F. Line a baking sheet with baking parchment and spray with non-stick cooking spray. Into a large bowl, sieve the flour and cornstarch adding the salt, cinnamon, and bicarbonate of soda. Stir well with a wooden spoon to combine the dry ingredients then pop to one side for later use. Melt butter in a medium pan over medium heat, cook the butter until it turns a golden brown colour. Stir occasionally to prevent burning. When the butter has turned brown, pour into a large, heatproof mixing bowl. Add in both the brown and the white sugar along with the vanilla whisking to combine. Beat in the eggs, one at a time with a wooden spoon. Gently fold in the flour mixture followed by the buttered pecans. Cover the bowl and refrigerate for at least 4 hours to allow the butter to cool and re-solidify. When you are ready to bake, leave the dough out on a countertop for about an hour so that it can be spooned easily. 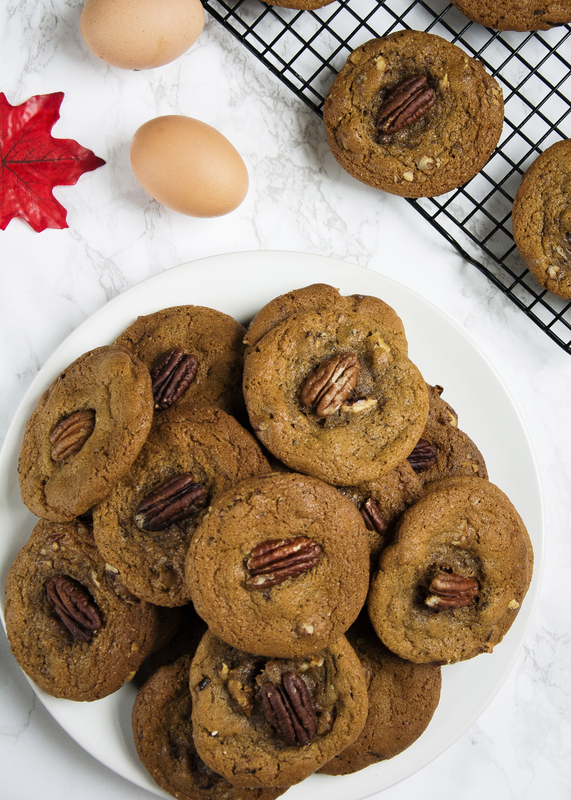 Scoop tablespoon-sized rounds of dough onto the baking tray, leaving 2 inches in between each cookie to allow them to spread. 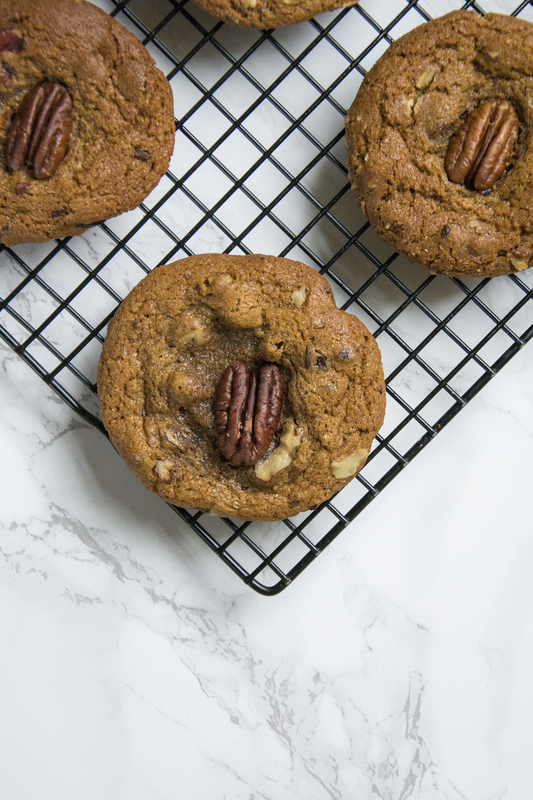 Press a pecan half on top of each ball of cookie dough, then bake for 9 minutes, or until the edges of the cookies are firm but the centre is still soft. 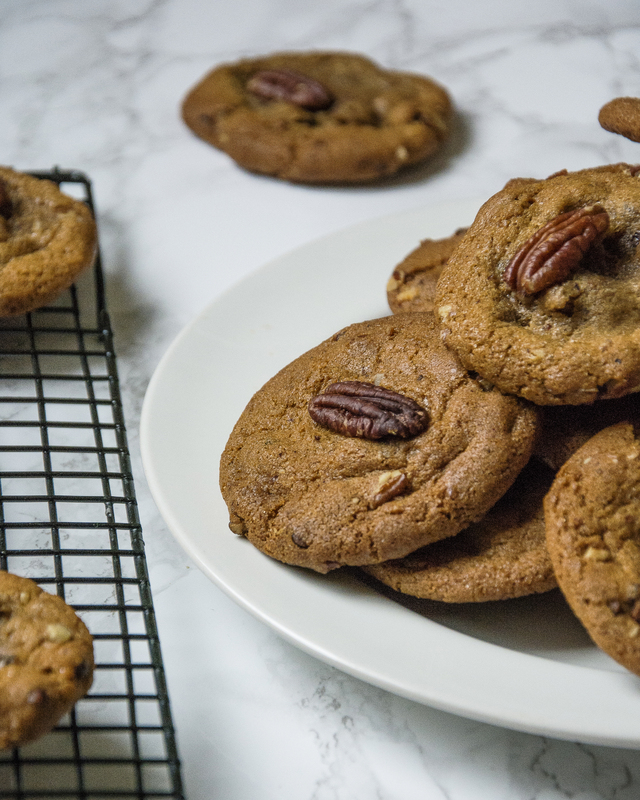 Allow cookies to cool on the tray for 10 minutes, then carefully transfer to a cooling rack and repeat until all the dough is used. And there you have it, the perfect brown butter cookies. If you give this recipe a try let me know how it goes by tagging @whatseatingmanchester in your social media post. For more baking inspiration don’t forget to check out my blog.